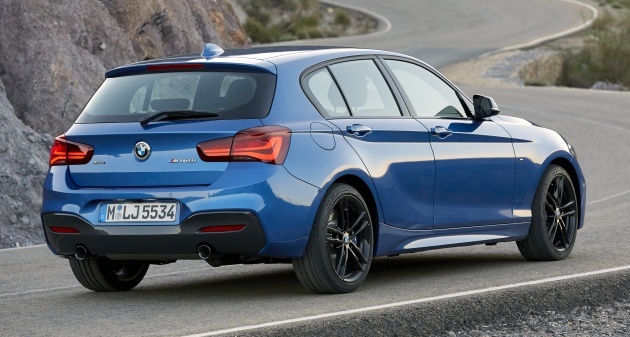 Much like the F30 BMW 3 Series, the F20 1 Series also gets its fair share of updates involving the hatchback’s styling as well as list of equipment changes. The former involves two new exterior body colours – Sunset Orange and Seaside Blue – along with five new wheel designs ranging from 17 to 18 inches in size. 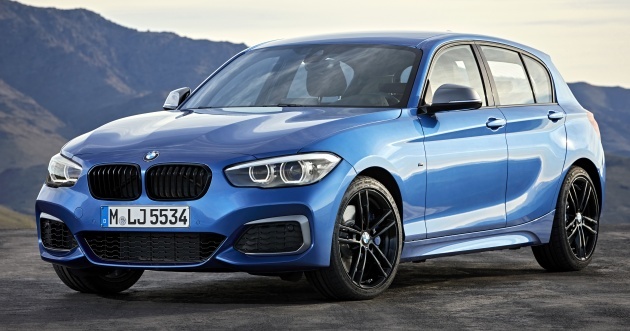 BMW has also introduced three special edition models – Edition Sport Line Shadow, Edition M Sport Shadow and BMW M140i Edition Shadow. Each “Shadow” model features a black kidney grille surround, black inserts on the LED headlights, dark tinted rear taillights and black chrome exhaust tailpipe finishers. Customers who opt for the Edition Sport Line Shadow will get 17-inch light-alloy wheels (725) as standard, while Edition M Sport Shadow buyers receive 18-inch (719 M) wheels in either Jet Black or Bicolour Jet Black. Meanwhile, M140i Edition Shadow cars are fitted with 18-inch light-alloy wheels (436 M) instead, finished in Orbit Grey. While the exterior modifications may appear to be subtle, the revisions to the 1 Series’ interior are a little more pronounced by comparison. For starters, there’s a new instrument display with a black panel design, along with redesigned air vents, chrome buttons for the power windows and high-gloss black surface for the centre stack. Customers can also choose a new Cognac Dakota leather for their seat coverings, including a choice of seven cloth variants (including leather or Alcantara). Elsewhere, the interior trim strips are now available with Pearl Chrome accents. BMW also tweaked the familiar Urban Line, Sport Line and M Sport packages, where the former now includes new combinations of white or black acrylic glass with chrome detailing. As for the Sport Line and M Sport packages, they can now be ordered with new combinations of Piano Finish Black, aluminium or Fineline wood trim with chrome. On the equipment front, cars fitted with the Navigation system Professional will get an 8.8-inch touchscreen display, with other systems retaining the iDrive Touch Controller and Intelligent voice control modes of interaction. 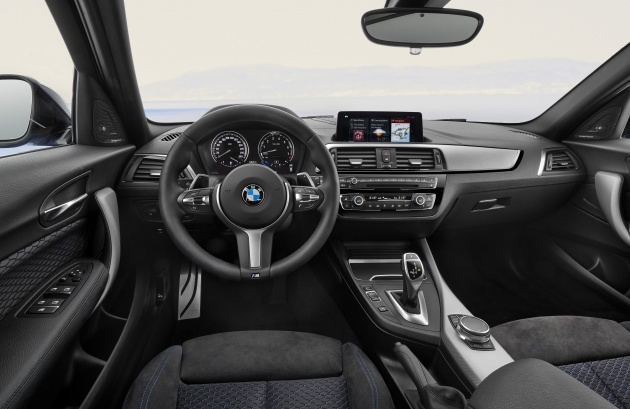 BMW’s ConnectedDrive services also offer real-time traffic information, remote smartphone link and a new Microsoft Exchange function, which allows Microsoft 365 users to securely send email and access calendars in the car. As for powertrains, a wide range of three-, four- and six-cylinder petrol plus diesel engines are available. Petrol engines have outputs ranging from 107 hp/180 Nm (116i) to 335 hp/500 Nm (M140i), whereas oil burners provide between 114 hp/270 Nm (116d) to 221 hp/450 Nm (125d). All models, except for the 116i, 116d EfficientDynamics Edition and 118d xDrive can be specified with an eight-speed Steptronic or eight-speed Steptronic Sport transmission as an alternative to the six-speed manual. The two exceptions are the 116i, which is manual only, and the automatic-only M140i xDrive (eight-speed Steptronic Sport transmission). Furthermore, BMW’s xDrive all-wheel drive system is available for the M140i, 118d and 120d.